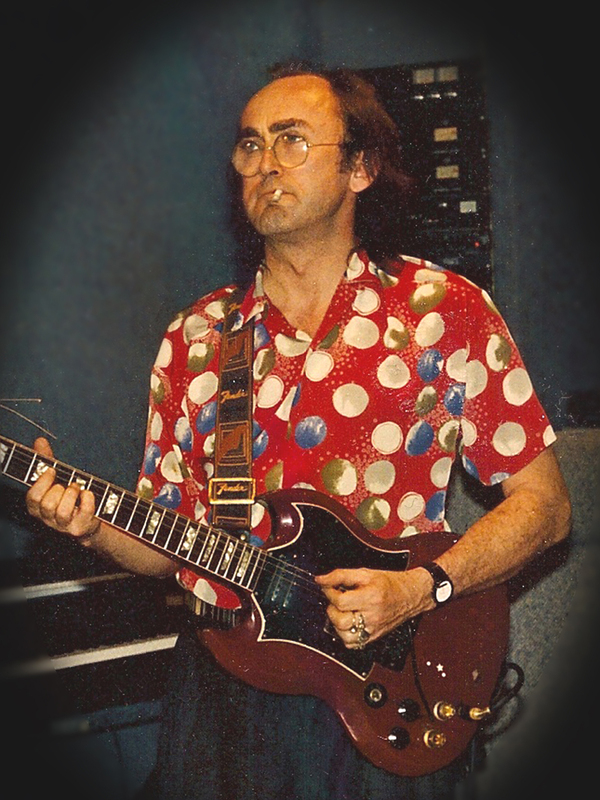 I was Viv's MD since the demise of the Bonzos until his death and I was there at the Bloomsbury in my role as shouter, fixer, sorter-outer of Viv's often chaotic arrangement ideas, duet vocalist and various instruments. I played on the first night when Jack played bass and then after an altercation with Viv (over expenses?) 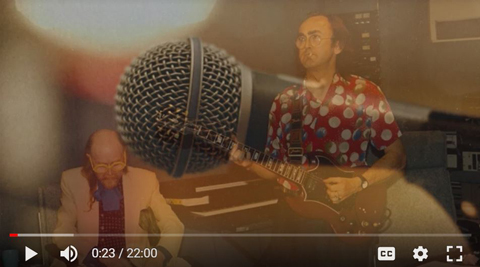 Jack was gone; Andrew Sheehan of Charisma came to me and said that the whole thing had to be sat upon hard and tightened up and so from the second night on I photocopied parts, took over on bass and generally did the sergeant-major (as Viv would say) bit. The best night (magic, in fact) was the fourth, a Thursday when all slotted in together so well, Ollie played magically and John (Halsey) played a storm, Roger blew himself up really well and Dave (Swarbrick) actually heard what he was playing, Viv and I performed "Stripe me a Pinkie" as an acappella duet and everyone was certain Viv was on the way back up. However, pressure took over and Viv lost focus for the last couple of nights and we all know how that always turned out. A further sad note was that the record company (Charisma?) made the mistake of recording the FIRST night! and, from what I subsequently learned from Andrew, most of that night was unkeepable. In the mid-1970s, a friend of mine, who lodged at our family home in Finchley, worked in some capacity as roadie, sound engineer, minder, whatever for Viv, who lived an unsettlingly convenient cycle ride away and would arrive unexpectedly to discuss business with his employee. 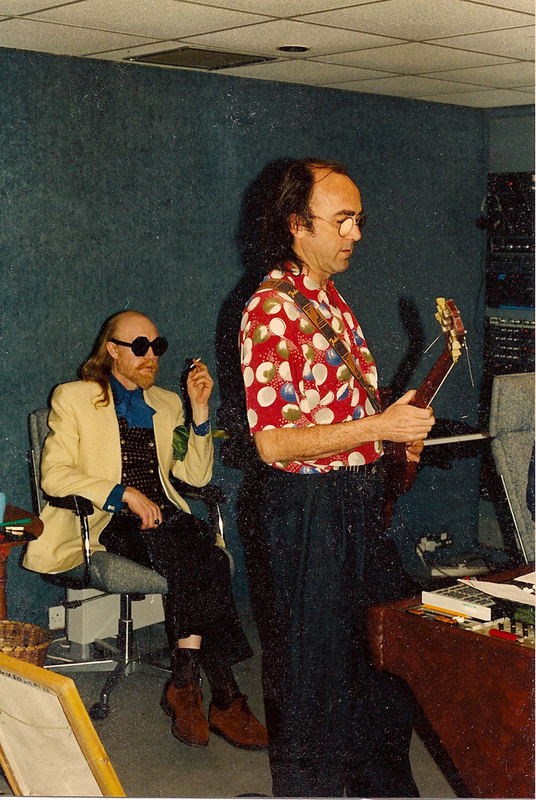 We had a small studio in the house and, on one occasion, had just finished a backing track when Mr Stanshall appeared in all his glory. "What's that?" he demanded and insisted on having a copy to which he "would compose lyrics." It is unlikely they ever materialised and we never saw or heard them in any event. My dear mother, who often had the misfortune to answer the door to these visits once confided, "I don't like it when that man comes round." 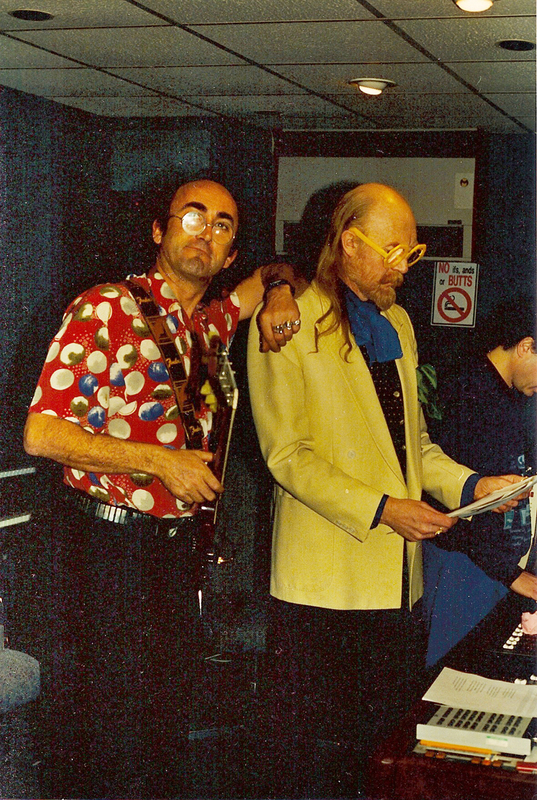 On April 9,1991 I left my New Jersey home to travel to London England at the request of Vivian Stanshall. I had become friends with Vivian several years before through the publication of a Bonzo Dog Band fan club magazine, Doo Dah that my friends and I had started in back in 1985. I had visited Mr Stanshall as well as the other ex Bonzos before, but this time was different. I was actually being summoned . 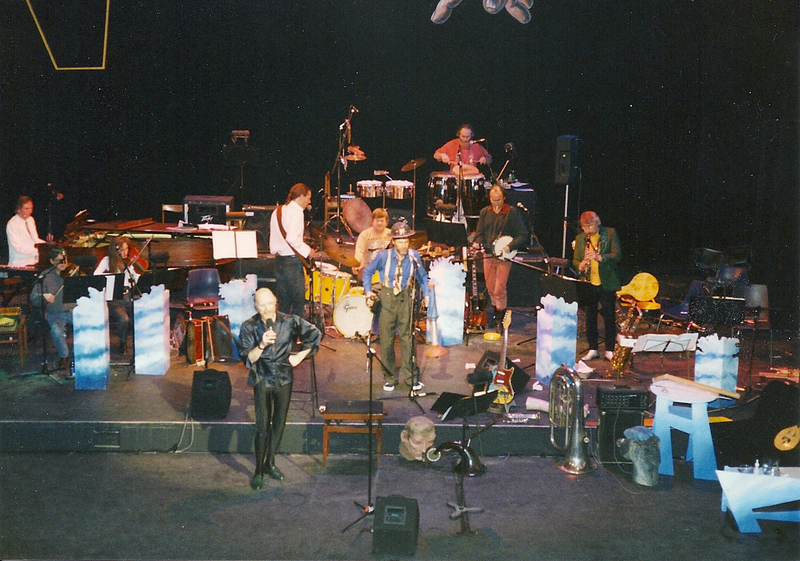 . .
Vivian had called me one night and said he was doing his first live show in many years and asked if I could come over and give him a hand. I wondered just what sort of assistance I could render but said OK anyway. It was quite a few years ago now but as I recall I didn't have much time to get there and as it turned out I arrived on the day the show started. 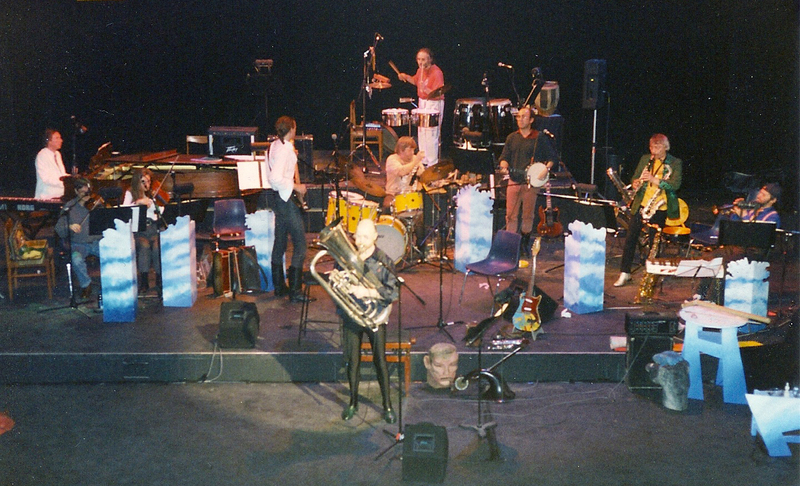 It was at the Bloomsbury Theater in London and Viv was playing several shows. I forget how many exactly. He had quite a cast of characters to back him up, one of which was Ollie Halsall. Ollie had come over from his home in Spain and was staying at Viv's place [in East Finchley, North London] as was I. In between shows he was also to go into the studio and add his talents to a new album Viv was working on. When the shows were over and just before Ollie was about to leave for home we sat down for an interview. It would have appeared in the 6th issue of Doo Dah, had there been one. At the time I knew next to nothing about Ollie except that he played guitar on one of my favorite albums, Neil Innes' How Sweet to be an Idiot. I had also seen his name on several other Bonzo related recordings but other than that as I said, I knew nothing. As you listen to the interview keep in mind that it was for a Bonzo Dog Band fanzine so the questions mostly revolve around his involvement with Vivian Stanshall, Neil Innes, and The Rutles. The other thing you might notice is that the interview starts rather abruptly - in mid sentence, as a matter of fact. Well it seems that for the first few minutes of the interview I had the pause button on. I deftly recovered from my horror and hit the start button without Ollie noticing. 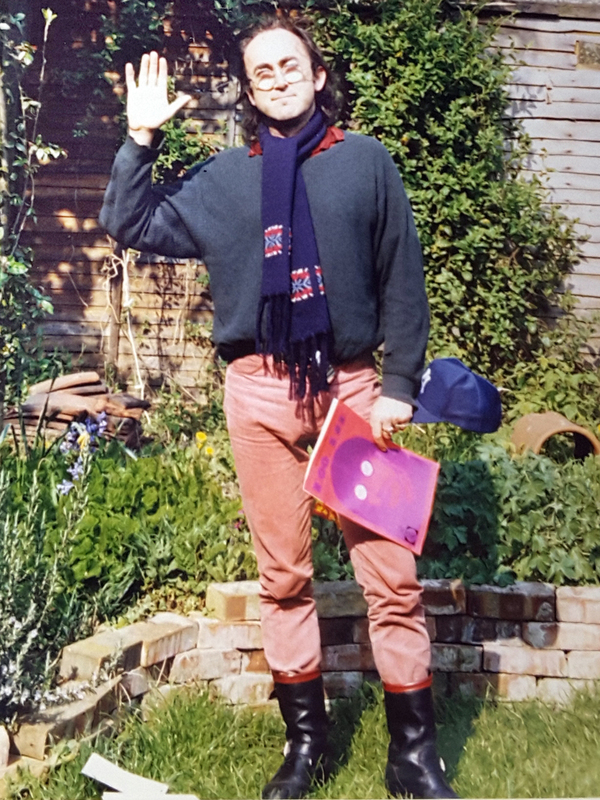 But most of what he had to say about the Rutles and everything he had to say about working on How Sweet To Be An Idiot was unfortunately lost. But what is left is quite special. Since we had already spent time together and got along quite well, he was very relaxed. I also got the impression he didn't get interviewed very often. I pretty much just asked a few short questions and let him go. So it's more of a conversation than an interview. Aside from the Bonzo stuff we discussed his leaving England for Spain, his meeting George Harrison, and his work with Kevin Ayers. It's short and sweet and I hope you all enjoy it. 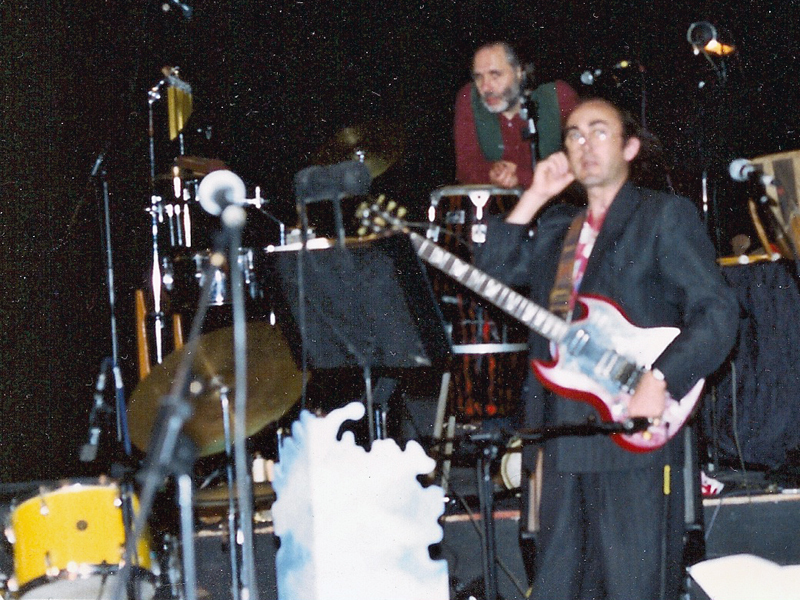 I did a gig with Ollie [and Kevin Ayers] at the Shaw Theatre - one of his last ones. My band were the support act for the first night [28 April 1992]. I saw him in the dressing room. I recognised his face from somewhere. 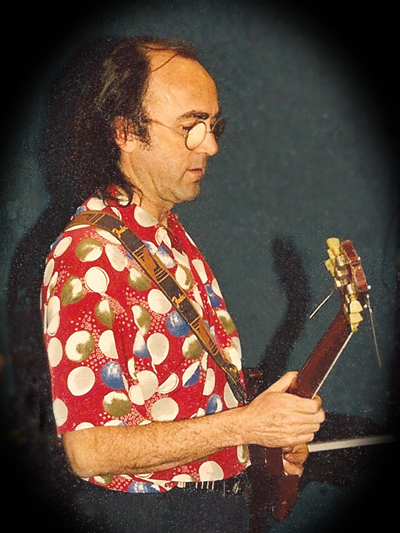 It's only now that I realise that I had seen him playing with Viv Stanshall at the Bloomsbury. 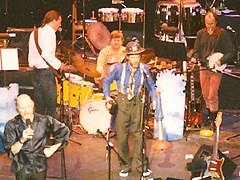 What a gig that was - Jack Bruce, Dave Swarbrick, Ollie, Viv. 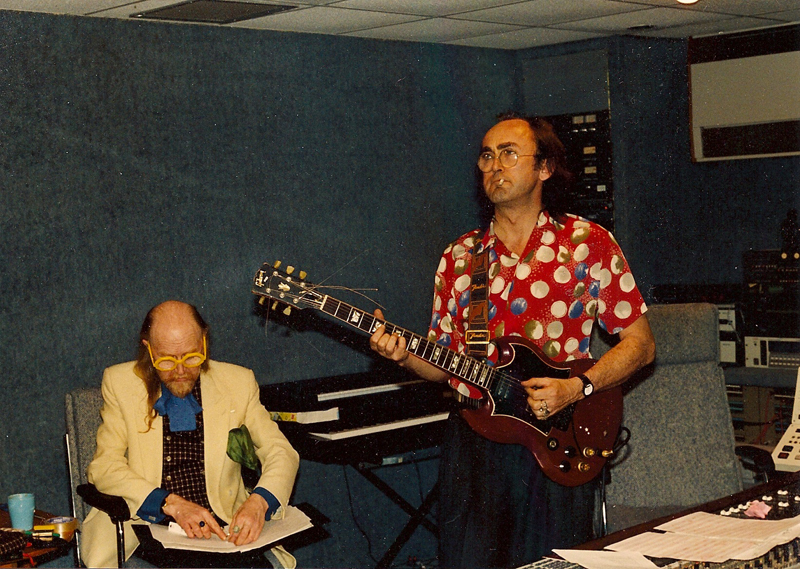 Stanshall was very nervous and kept speeding up and getting cross with the band. Ollie was raising his eyebrows a lot and muttering as Mr Stanshall battled stagefright, forgot lyrics and took it out on the band. If I knew then what I know now I would have spoken to Ollie, stole a Bert Weedon pick or something and watched his fingers more intently. Dean Cole was a wreck , running all over trying to keep things together - merchandise tables, Viv, etc. Michele to make sure his video camera doesn't fall over and, "Oh, by the way, can you sort of help film everybody?" So at least one night got filmed! Roger had a little yellow video camera , that looked like it belonged on The Yellow Submarine. Not sure whatever became of that footage. But I seem to remember Dean saying they wanted to sell the show as a video performance. Maybe Mr. Ruskin-Spear knows? 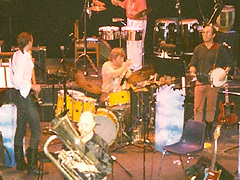 Percussionist top right is Cream lyricist Pete Brown, later of Piblokto and Pete Brown's Battered Ornaments. Jack Bruce played bass on the first night but then walked out saying he didn't want to be associated with something that was so un-together and under rehearsed! [John Halsey]. 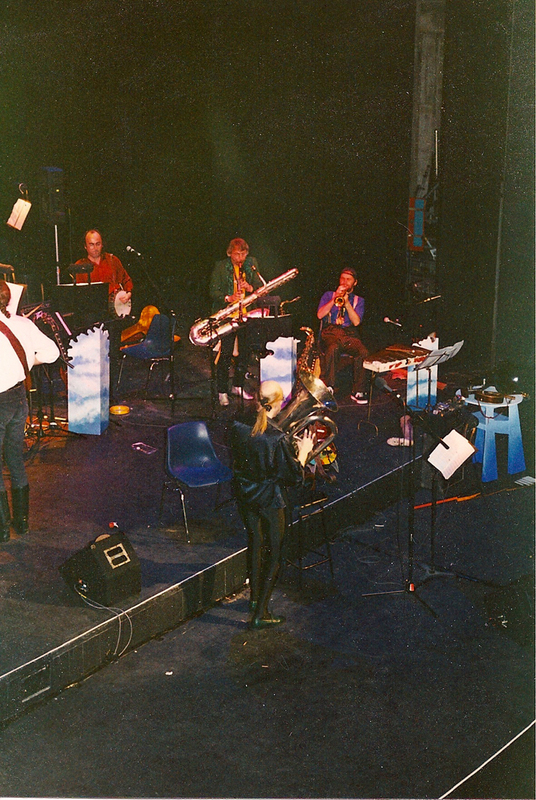 At the grand old age of 75, self described 'late developer' Lord Rodney, has gathered his flock of Parrots, including writing partner Michael 'Sir Henry at Rawlinson End' Livesley, Steely Dan's Elliott Randall, The Rutles' John 'Barry Wom' Halsey and The Mekons' Susie Honeyman - to record his debut LP of brand spanking new material. Lord Rodney has taken a look at the post-truth world we all now live in and has decided to hang up his hoe and leave his kitchen garden for a short while to offer us all his antidote - PARROTOPIA! However, PARROTOPIA! needs YOU!